The surfboard is such a part of American popular culture it is almost folkloric. 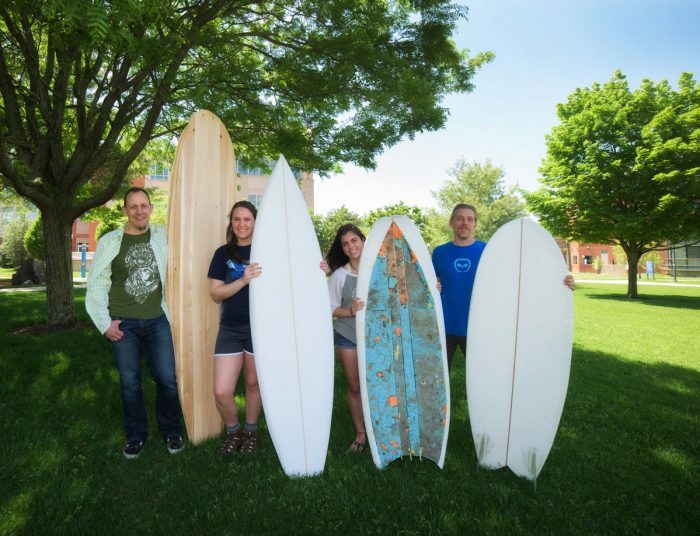 Think “Surfin’ Safari,” The Beach Boys, “Beach Blanket Bingo,” Gidget, and, more recently, “Lilo and Stitch” and “Blue Crush.” Surfing has been romanticized in the American imagination for generations, but how much do any of us really know about the sport or the surfboard itself? And in the end – they had surfboards! 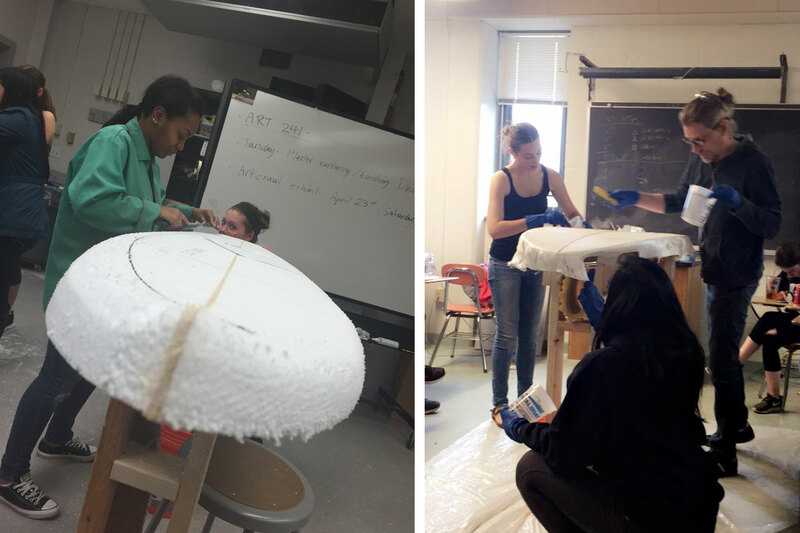 The class was divided into small groups, each of which was assigned a particular kind of surfboard to study and build. One board was to be made of sustainably-grown wood; another of expanded polystyrene foam (EPS), which is slightly better for the environment than other similar types of foam; and another of materials found on beaches, such as chunks of old foam buoys and docks that had washed up onto the shore. Slomba says these reclaimed materials had “living things inside them” — ants, ticks and other insects –when they were collected, and the creatures remained inside the materials while the students worked on their board. The proposed boards represented different levels of sustainability, says Heidkamp. Before actually tackling the job of making the boards, students researched the materials they would be using, interviewing manufacturers and other companies that supplied them with the components of the boards. They traced the commodity chain, learned about the history of surfing and its cultural origins, and made demo boards — scale models of the full-size boards they would eventually create. 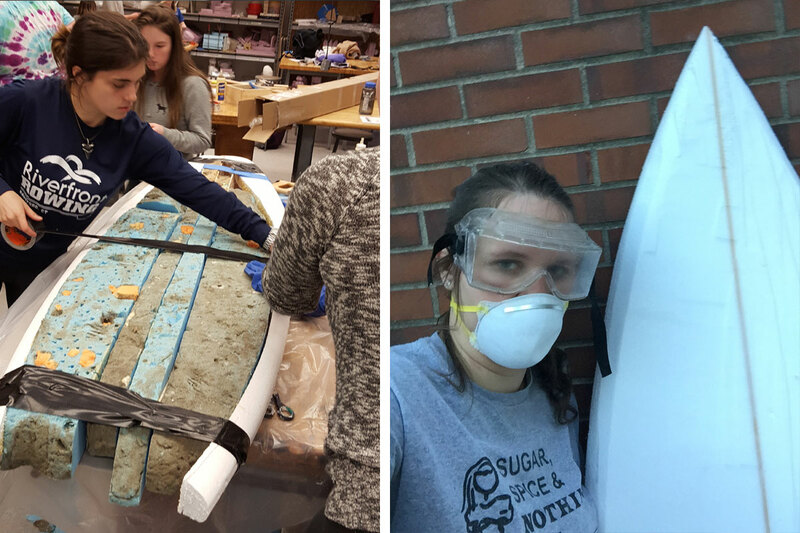 In the process, they also learned how to use the tools that were necessary to build their boards, creating empathy for workers who build boards for a living.